Non-Refundable Fee. Your S/ signature, email and phone number indicate your agreement to the Terms and Conditions. S/ signature, email and phone number. I hereby apply to attend the FDCPA Boot Camp and agree to all of the following Terms and Conditions. I will not receive a refund of my registration fee unless my application is rejected. I have read the FDCPA Boot Camp brochure on this website and agree to all of the terms in it. I am an attorney member of NACA, NACBA, NOSSCR, Legal Aid, JAG, non-profit organization, or a law firm that does no creditor work, or an employee of one. I am not a debt collector nor have I collected any consumer debts in the past 5 years. If I have ever acted as a debt collector, or worked at a law firm that collected debts, I have forwarded a written explanation to info@lawpoint.com. I have never defended, I am not defending, and I do not intend to defend consumer lawsuits, including FDCPA lawsuits. I will not sell, distribute, or duplicate any materials, media, forms, or other information obtained at the FDCPA Boot Camp, except as licensed for my professional use as described in the FDCPA Boot Camp brochure. I am not now nor have I ever been a member of NARCA, the National Association of Retail Collection Attorneys, the Commercial Law League, ACA International, the ACA, the American Collectors Association, or any other group, organization, or entity which advocates for the interests of creditors, or attorneys, or organizations who collect consumer debts. In making this application for the FDCPA Boot Camp, all of my representations have been true as indicated by my S/ signature on this page. Please call us at (612) 379-8800 Immediately if you are having any trouble registering. Thank you. Here’s the info for the hotel. The Boot Camp is going to be held right next-door to the hotel at 2828 University Ave SE, #150, Minneapolis, MN 55414. Get the best available rate you can at that hotel. There’s others in the area if you want to Uber in the morning, but this hotel is right next-door to the venue and in a great area of town. It’s a brand new hotel that provides breakfast and coffee in the morning and is right on the light rail line so you can head downtown in the evenings, etc. It’s very centrally located. Attendees should make all reservations directly with the hotel and direct any questions to them. Questions on special requests (e.g., need a double suite, earlier arrival, later departure, roll-in shower, etc.) you can contact the hotel directly. Our days are very long, so come in a day early or stay a day later if you want to sightsee. Free WiFi available in the conference room. BE SURE TO BRING YOUR LAPTOP! The boot camp lasts two days and is held multiple times throughout the year and around the country, as announced. The boot camp is a multi-media and information-packed instruction on bringing Fair Debt Collection Practices Act claims for consumers. The FDCPA Boot Camp: Suing Debt Collectors Just Got Easier. More than 1,000 lawyers from across all 50 states, Washington DC, and Puerto Rico have attended the FDCPA Boot Camp. Every one of them walked away with greater insight, better instinct, and a sharper sense of what makes a great FDCPA case. The boot camp is an intensive, hands-on curriculum designed to help you launch your Plaintiff's FDCPA practice immediately. The boot camp is taught by Pete Barry, one of the most-well known consumer lawyers in America, and his law partner Patrick Helwig. It's practical training based upon not just theory, but practice. Together they have personally handled thousands of FDCPA cases since 1996 and have consulted on countless others around the country. You simply will not find a better or more approachable method anywhere to learn the FDCPA. In addition to all the nuts and bolts of an active and successful FDCPA practice, you also get an unrivaled federal litigation forms database on a handy USB drive to get you started. A Buddy Rate of is available to the second qualified person attending the same FDCPA Boot Camp, who is from the same firm or living within 50 miles of another registered and fully paid boot camper. Only one Buddy Rate admission per regular paid attorney, please. The Buddy Rate is also available to Military JAG, Legal Aid, Public Sector, and Repeat Boot Camper attorneys. You must be a NACA, NACBA, Military JAG, Legal Services Corporation, or other consumer attorney to attend. 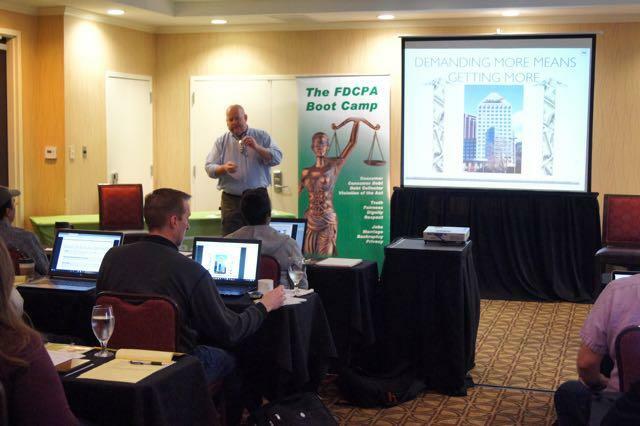 Reserve your seat early as the the FDCPA Boot Camp fills quickly. If you qualify for the buddy rate, click here to request a registration discount. Feedback from past attendees of the FDCPA Boot Camp: "It's a seminar on steroids." I wanted to thank you guys again for providing this 2.5 day boot camp. I have 2 year old twins and a 3 month old at home. So making the decision to leave for a long weekend did not come easy. However, you guys did not disappoint! I’ve been on the fence for years regarding whether to actively pursue this area of the law. Listening to you guys and reading through the mound of material you provided helped me convince myself that I would enjoy suing debt collectors and that I can make a good living doing it. I think it is reasonable to believe that if I litigate cases for 30 more years I will not attend a seminar that is more practical or helpful than your FDCPA Boot Camp. I wish you guys the best of luck going forward. Thank you. I attended the boot camp in San Diego last July, and just wanted to let you know what a great experience that was and thank you for the excellent job you did. It was really inspirational as a young lawyer to hear from a consumer advocate that was so confident about taking on debt collectors. I also really appreciated how you seem like a normal guy and are not some stuffy, arrogant, know-it-all Ivy leaguer, but still have had tremendous success in your practice. Working in legal services, I deal with a lot of lawyers that are terrified of filing lawsuits and going to court, so it was just great to listen to someone that is not that way. The sample pleadings you provided are fantastic. I recently settled my first FDCPA lawsuit, and am on the verge of settling another. I used your pleadings as a template in both cases. Getting good results in these cases has really made me look good in the eyes of my employer. So again, thank you for the great experience. I am glad you are out there fighting the good fight and providing education and inspiration to young attorneys like me. I was ready to walk away from my solo practice after years of trying cases as a criminal defense lawyer. I attended Pete's Bootcamp and it inspired me to begin helping consumers. Two years later I have a three lawyer, three paralegal firm. I will never be able to thank Pete enough for what he taught me in three days. Helping consumers who are being beat up by debt buyers and debt collectors is not only rewarding, it is fun! The FDCPA Boot Camp was a great three days! Pete Barry is definitely the hardest-working man in showbiz. I'm so full of ideas right now that I had to stop in the middle of my drive home in order to write this note from a hotspot. In the three hours since I left the bootcamp, I received four calls with excellent FDCPA or TCPA cases that I am going to put into suit in the next week. With what I just learned from Pete, I have five more clients to write asap. I'm not going to sleep tonight, I'm so thrilled. Thank you for hitting us so hard with information that my head is spinning. Every other CLE I've ever been to, frankly falls as third-rate, mediocre, and worthless in comparison to the Boot Camp. Whew. I just settled my first FDCPA case pre-answer, and my client is thrilled with the outcome. The terms of the settlement agreement are confidential, but I can confirm that the Boot Camp paid for itself five times over based solely on the attorney fees I collected from this case. In other words, even if I never litigate another FDCPA case, the Boot Camp has already given me a 500% return on investment. While I hope to continue to represent consumers who suffered from FDCPA violations, one of the great things about the Boot Camp is that the knowledge Pete dispenses is transferable to other areas of litigation; the primary focus of my practice is representing plaintiffs in employment and civil rights matters, and I have successfully employed many of Pete's strategies to obtain favorable outcomes for my clients in several non-FDCPA cases. It is not an overstatement to say that the money I spent on the Boot Camp was the best investment I have made since I launched my solo practice, and I highly recommend the course to any litigator who represents consumer plaintiffs. Since implementing the skills taught by Pete Barry at his FDCPA Boot Camp, we have quadrupled the recovery for our debt collection harassment cases. The FDCPA Boot Camp was amazing. It is the best seminar I have ever been to in twenty five years of practicing law. I learned more in three days than I learned in the past ten years. The written materials were also incredibly informative and comprehensive. I have been home a little more than a week, I have received more than a dozen calls, and I have met with four potential clients. I am now just trying to figure out which cases I will put into suit first. Thanks for everything. I'm sure our paths will cross again. The FDCPA Boot Camp is, without a doubt, the single most effective tool for getting up to speed on claims under the act and maximizing damages for your clients. This isn’t your typical lecture: Mr. Barry’s dynamic, in-your-face speaking and litigation style captivates your attention and inspires you to achieve. The bootcamp has already paid for itself in terms of time and money saved. Pete gives you the tools you need to sue abusive debt collectors, and he genuinely wants to see other FDCPA lawyers succeed. The seminar, the toolkit and the war stories are exactly what you need to jump start an FDCPA practice. Pete is an invaluable resource, even after the bootcamp. Just do it. You won't regret attending the bootcamp. It's a seminar on steroids. I highly recommend the boot camp. I was able to settle my first filed FDCPA case for $15,000 because I took the FDCPA boot camp and because of the great help I received from Pete Barry. I couldn't have done it without his help. Mail registrations must be completed at least (7) days before the scheduled start of the boot camp you're attending. It's a good idea to email us at info@lawpoint.com to let us know your registration and payment are forthcoming so we can plan accordingly in terms of conference room facilities, etc.